Geologists visited Ahuan fumarole on 23 November. The fumarole temperature was 305°C, a decrease from 336°C measured in May 1988. Information Contacts: Kurt Roggensack, Helen Mango, John Lucio, and Half Zantop, Dartmouth College. The Global Volcanism Program has no Weekly Reports available for Michoacán-Guanajuato. "Fumaroles at several localities were emitting small amounts of acid gases but there was no visible plume at the summit or elsewhere when visited 28 April-1 May. Temperatures were mostly less than 150°C but some were much hotter, over 400°C." Information Contacts: R. Stoiber, L. Benton, C. Connor, D. Douglass, D. Shumway, and J. Swartz, Dartmouth College. "Fumarolic activity persisted at Ahuan vent on the SW flank. When temperatures were measured at Ahuan vent on 29 November, the hottest fumarole was 473°C, 70° higher than in April 1983, when Dartmouth scientists last measured temperatures at Parícutin. Several fumaroles over an area of about 50 m2 were hotter than 300°C. No physical changes in the area were apparent since April 1983." Information Contacts: C. Connor, B. Gemmell, and R. Stoiber, Dartmouth College. When geologists visited Parícutin 26 November, fumaroles were emitting HCl-dominated gases. 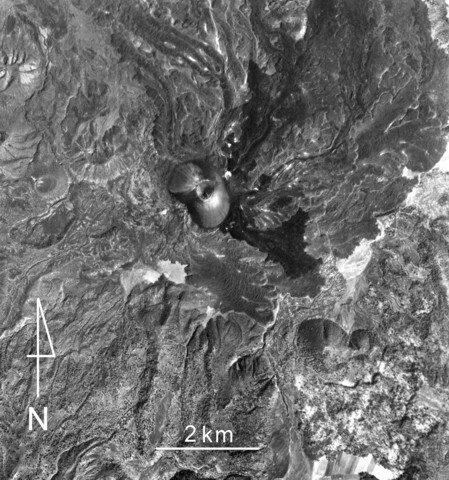 The temperature of Ahuan fumarole (on the SW flank) was 375°C, about 100° lower than in November 1985. Other fumaroles remained at about 100°C. No other changes were observed. Information Contacts: R. Stoiber, C. Connor, and other geologists, Dartmouth College. Geologists mapped fumaroles and measured temperatures on 8 and 16 May. As in previous years, fumaroles were hottest at Ahuan vent (figure 1) but had cooled to 336°C, from 473° in November 1985 and 375° in November 1986. The area seemed morphologically unchanged since April 1983. Fumaroles at Sapichu vent ranged from 186° to 275°C, an increase of as much as 120° since they were last measured in April 1983. Sulfur continued to be deposited around the Sapichu fumaroles. All other fumaroles at Parícutin had temperatures of <200°C, most <100°. Fumaroles on the crater rim and along major flow levees ranged from 60° to 80°C, essentially unchanged since April 1983. Figure 1. Distribution of fumaroles at Parícutin, May 1988. Fumaroles were found in the shaded areas (stipple pattern, <100°C, solid pattern, >100°C). 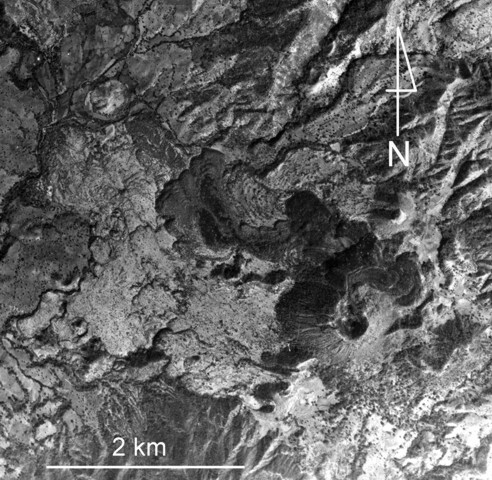 Three vents are labeled: Ahuan (A), the main crater (P), and Sapichu (S). The W and SW margins of lava flows surrounding the cone are indicated by the stippled border. Information Contacts: C. Connor, James Diaz, and Jorge Corrales, FIU, Miami; Ana Lillian Martin-Del Pozzo, Instituto de Geofísica, UNAM, México. The widespread Michoacán-Guanajuato volcanic field contains over 1400 vents, including the historically active cinder cones of Parícutin and Jorullo, covering a 200 x 250 km wide area of Michoacán and Guanajuato states in west-central México. 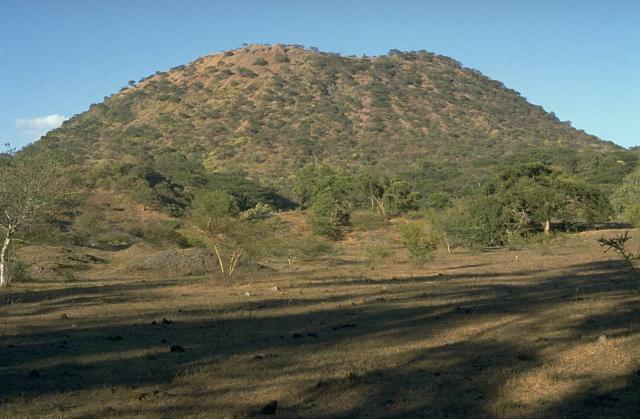 Cinder cones are the predominant volcanic form, but small shield volcanoes, lava domes, maars and tuff rings (many in the Valle de Santiago area), and coneless lava flows are also present. The shield volcanoes are mostly Pleistocene in age, and have morphologies similar to small Icelandic-type shield volcanoes, although the Michoacán-Guanajuato shields have higher slope angles and smaller basal diameters. Jorullo, which was constructed in the 18th century, and Parícutin, which grew above a former cornfield during 1943-52, are the two best known of the roughly 1000 small volcanic centers scattered throughout the volcanic field. Alonso H, 1976. Geothermal potential of Mexico. In: Proc 2nd United Nations Symp Devel Use Geotherm Resour, San Francisco, Washington D C: U S Government Printing Office, 1: 621-624. Ban M, Hasenaka T, Delgado G H, Takaoka N, 1992. K-Ar ages of lavas from shield volcanoes in the Michoacan-Guanajuato volcanic field, Mexico. Geof Internac, 31: 467-473. Erlund E J, Cashman K V, Wallace P J, Pioli L, Rosi M, Johnson E, Delgado Granados H, 2010. Compositional evolution of magma from Paricutin Volcano, Mexico: the tephra record. J. Volcanol. Geotherm. Res., 197: 167-187. Foshag W F, Gonzalez-Reyna J, 1956. 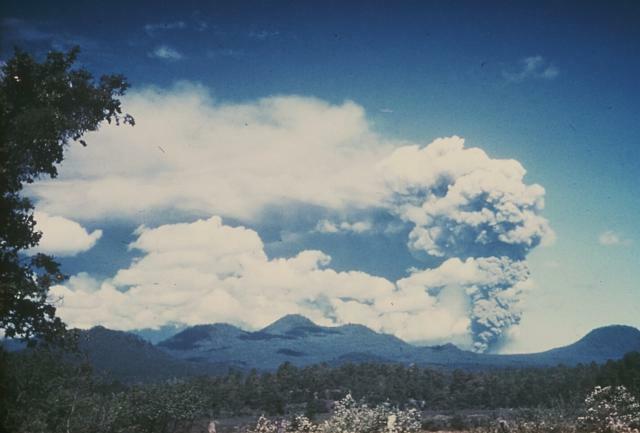 Birth and development of Paricutin volcano. U S Geol Surv Bull, 965-D: 355-489. Fries C Jr, 1953. Volumes and weights of pyroclastic material, lava, and water erupted by Paricutin Volcano, Michoacan, Mexico. Eos, Trans Amer Geophys Union, 34: 603-616. Gadow H, 1930. Jorullo. London: Cambridge Univ Press, 100 p.
Garduno-Monroy V H, Corona-Chavez P, Israde-Alcantara I, Mennella L, Arreygue E, Bigioggero B, Chiesa S, 1999. Carta Geologica de Michoacan. Univ Michoacana de San Nicolás de Hidalgo, 1:250,000 scale. Hasenaka T, 1994. Size, distribution, and magma output rate for shield volcanoes of the Michoacan-Guanajuato volcanic field, Central Mexico. J. Volcanol. Geotherm. Res., 63: 13-31. Hasenaka T, Carmichael I S E, 1985. The cinder cones of Michoacan-Guanajuato, central Mexico: their age, volume and distribution, and magma discharge rate. J. Volcanol. Geotherm. Res., 25: 105-124. Luhr J F, Carmichael I S E, 1985. 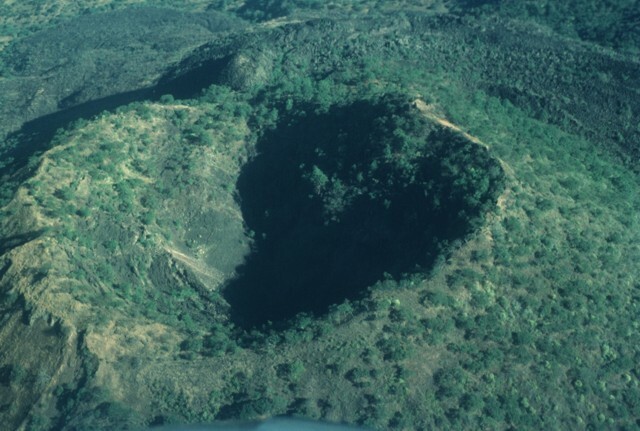 Jorullo volcano, Michoacan, Mexico (1759-1774): the earliest stages of fractionation in calc-alkaline magmas. Contr Mineral Petr, 90: 142-161. Luhr J F, Delgado-Granados H, 1997. Aerial examination of volcanoes along the front of the western Trans-Mexican volcanic belt and a visit to Paricutin. IAVCEI General Assembly, Puerto Vallarta, Mexico, January 19-24, 1997, Fieldtrip Guidebook, Excursion no 9, 38 p.
Luhr J F, Simkin T (eds), 1993. Paricutin: The Volcano Born in a Mexican Cornfield. Phoenix: Geoscience Press, 427 p.
Morelli S, Garduno Monroy V H, Gigli G, Falorni G, Arreygue Rocha E, Casagli N, 2010. The Tancitaro debris avalanche: characterization, propagation and modeling. J. Volcanol. Geotherm. Res., 193: 93-105. Nelson S A, Sanchez-Rubio G, 1986. Trans Mexican volcanic belt field guide. Geol Assoc Can, 108 p.
Ordonez M E, 1906. De Mexico a Jalapa. 10th Internatl Geol Cong, Mexico, Excur Guide, 1: 1-11. Ort M H, Elson M D, Anderson K C, Duffield W A, Hooten J A, Champion D E, Waring G, 2008. Effects of scoria-cone eruptions upon nearby human communities. Geol Soc Amer Bull, 120: 476-486. Ownby S, Delgado Granados H, Lange R A, Hall C M, 2007. Volcan Tancitaro, Michoacan, Mexico, 40Ar/39Ar constraints on its history of sector collapse. J. Volcanol. Geotherm. Res., 161:1-14. Rodriguez-Elizarraras S, Komorowski J-C, Jimenez V, Siebe C, 1993. Libro-guia de la excursion geologica al volcan Paricutin, Estado de Michoacan, Mexico. Translated Title: Guidebook for a field trip to Paricutin Volcano, Michoacan, Mexico. Mexico City, Mexico: Univ Nac Auton Mex, Inst Geol, 130 p.
Segerstrom K, 1950. Erosion studies at Paricutin, State of Michoacan, Mexico. U S Geol Surv Bull, 965-A: 1-164. Uribe-Cifuentes R M, Urrutia-Fucugauchi J, 1999. Paleomagnetic study of the Valle de Santiago volcanics, Michoacan-Guanajuato volcanic field, Mexico. Geof Internac, 38: 217-230. Waitz P, 1906. Les geysers d'Ixtlan. 10th Internatl Geol Cong, Mexico, Excur Guide, 12: 1-22. Williams H, 1950. Volcanoes of the Paricutin region Mexico. U S Geol Surv Bull, 965-B: 165-279. Yarza de la Torre E, 1971. Volcanes de Mexico. Mexico City, Mexico: Aguilar, 237 p.
5940 BCE ± 335 years Unknown Confirmed Radiocarbon (corrected) Cerro Grande? Averaged 2007?2011 LOS velocity map of the Trans-Mexican Volcanic Belt, from ALOS InSAR. Only pixels with a temporal coherence larger than 0.7 are shown. Red triangles: historically active volcanoes (bold: those active during the survey period). Black triangles: other volcanoes. Black diamonds: major cities near volcanoes. White arrow: relative plate convergence rate at the Cocos Trench. Positive LOS velocities (uplift) are shown in red and negative LOS velocities (subsidence) in blue. Labeled insets: zoomed in for volcanoes showing deformation (Pari?cutin) or volcanoes active during the time period of the survey (Colima and Popocate?petl). These insets have a smaller color scale. Bottom right inset: LOS velocity map of El Chicho?n, volcano located southeast of the area shown. From: Chaussard et al. 2013. Reference List: Fournier et al. 2010; Chaussard et al. 2013. There is no Emissions History data available for Michoacán-Guanajuato. 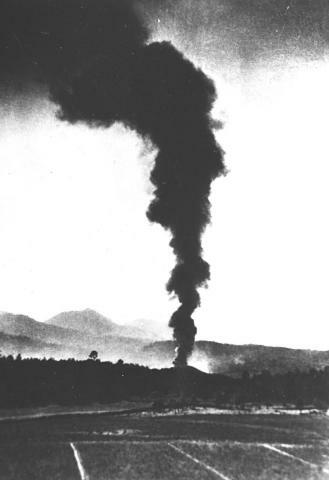 An ash column rising above Parícutin is seen on June 9, 1943 from the Uruapan highway east of the volcano. Prevailing winds distribute the ash plume to the south. Others of the more than 1000 cinder cones of the massive Michoacán-Guanajuato volcanic field appear on the horizon. Photo by William Foshag, 1943 (Smithsonian Institution). A roughly 15-second time-exposure at night shows the incandescent trajectories of ejecta from Parícutin on August 1, 1943, during the early stages of the 1943-52 eruption. Periodic large explosions observed at this time burst huge lava bubbles in the vent, rapidly ejecting large masses of incandescent orange spatter. Photo by Carl Fries, 1943 (U.S. Geological Survey). Parícutin emits a shower of glowing embers in this painting by Dr. Atl, the renowned Mexican artist and Renaissance man. 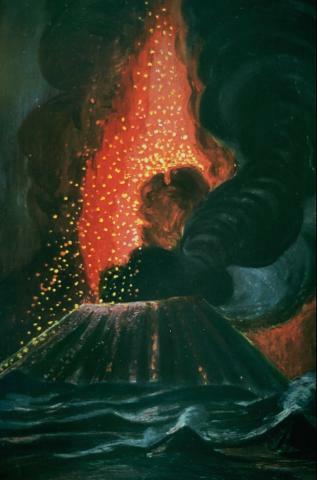 He correctly noted that time-exposure color photos of these strombolian eruptions portray the volcanic bombs as luminous parabolas, giving a misleading view of the character of the eruptions. Painting by Dr. Atl (published in Luhr and Simkin, 1993). The tower of the unfinished San Juan Parangaricutiro church rises above lava flows from Parícutin that surrounded it in 1944. 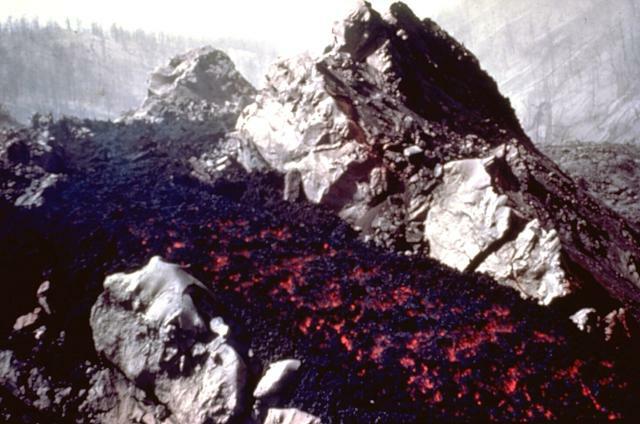 The Taquí lava flow began on January 8, 1944, from the SW base of Parícutin. 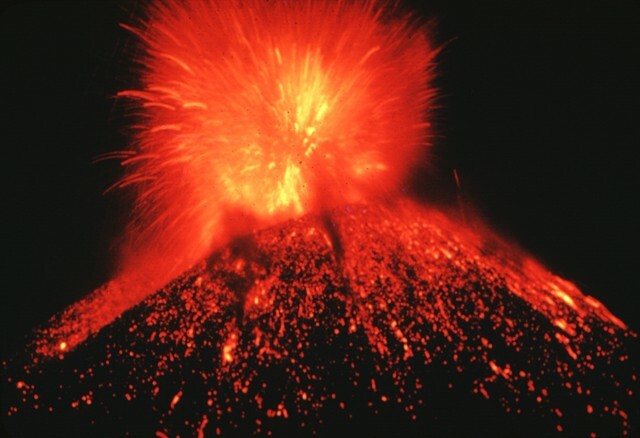 Renewed effusion on April 24 produced lava tongues that threatened the town of San Juan Parangaricutiro and, by June 17, invaded it. The church was surrounded by lava in July. By the time the flow ceased movement in early August it had a length of 10 km. Photo by James Allan, 1985 (Smithsonian Institution). Parícutin, the volcano born in cornfield in 1943, is the best-known feature of the Michoacán-Guanajuato volcanic field. The huge volcanic field contains over 1400 vents covering a wide area of Michoacán and Guanajuato states. Cinder cones are the predominant volcanic form, but small shield volcanoes, lava domes, maars, tuff rings, and coneless lava flows are also present. Parícutin is seen here from the NE with 3842-m-high Cerro de Tancítaro, the highest peak of the volcanic field, in the background. Sequential profiles show the progessive growth of Parícutin volcano. The bulk of the volcano's growth took place during the first year (darker red profiles), after which cone growth slowed for the following two years. Dashed lines at the left show the cone's profile prior to a major slump of the northern flank on June 9, 1943, produced when part of the cone was carried away by rapid lava effusion from the base of the cone. The final cross section made in 1974 shows the cone's profile two decades after the end of the eruption. Sketch published in Luhr and Simkin (1993). 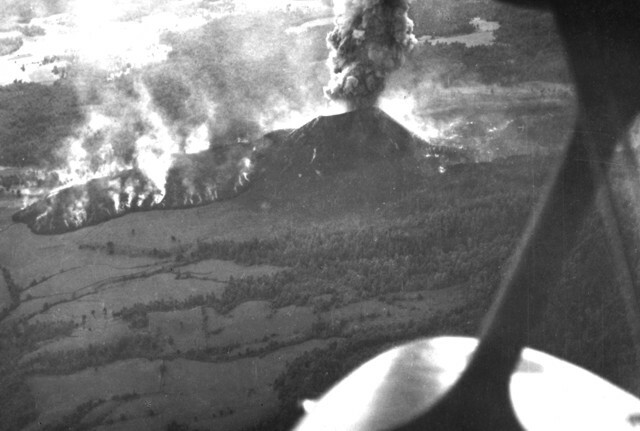 An aerial view from the NNW on March 5, 1943, about two weeks after the start of the eruption, shows the Quitzocho lava flow advancing to the NE as an ash plume rises from the cinder cone. The flow advanced in a rubbly sheet about 6 to 15 m high. Its volatile content was higher than in later Parícutin lava flows, and fumaroles pour from the margins of the flow. This photo was taken during the second of two flow surges, which took place from February 28 to March 20. Photo by Ezequiel Ordonez, 1943 (U.S. National Archives). 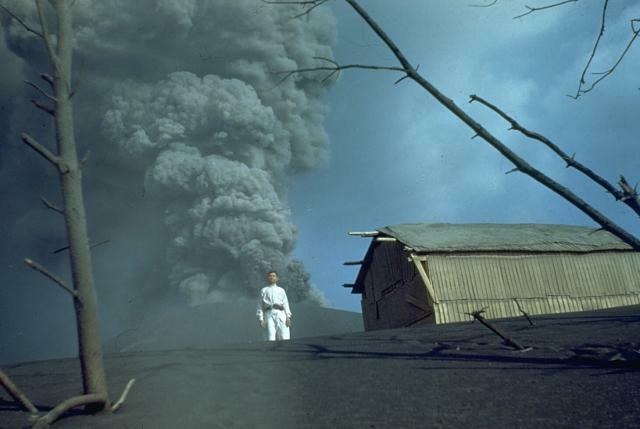 A dark ash plume, seen here from the NE, rises above the new volcano on February 21, 1943, the 2nd day of the eruption. The new cone, seen just rising above the tree tops, is about 30 m high. During this early stage the cone had the shape of a low dome, with slope angles of 32 degrees toward the west, but lesser angles to the east. This indicates that the cone had already been breached and that lava had begun flowing to the east. Photo by Salvador Ceja, 1943 (U.S. National Archives, published in Luhr and Simkin, 1993). An incandescent lava flow travels down a channel within solidified lava near the SW-flank vents of Parícutin in 1945. Lava flows at this time traveled NW over the site of the village of Parícutin. 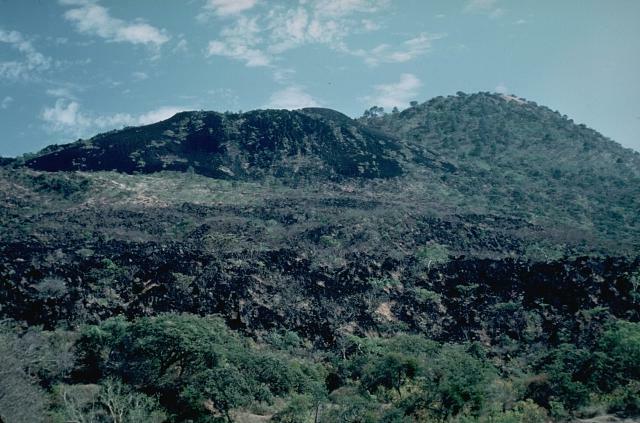 The Taquí lava flows, erupted during 1944-45, covered about 18 sq km. 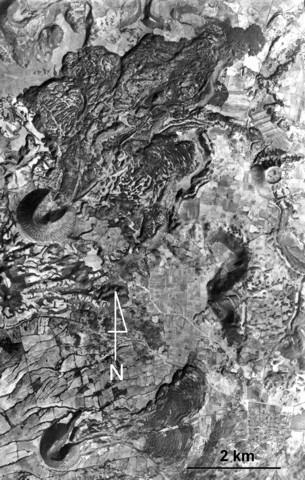 The most striking feature of the Taquí flows was the development of hornitos (rootless vents) formed when clots of molten lava were ejected through overlying solidified crust. 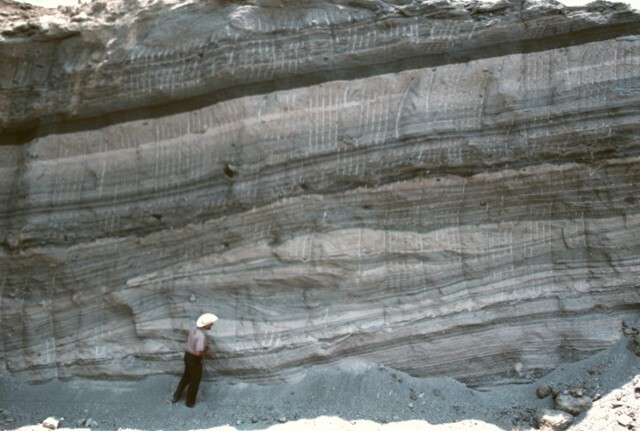 Photo by Ken Segerstrom, 1945 (U.S. Geological Survey, published in Luhr and Simkin, 1993). A gray convecting plume rises above Parícutin in October 1944. Much of the eruption column consists of ash-poor steam. The photo was taken from the north at the outskirts of the town of San Juan Parangaricutiro. 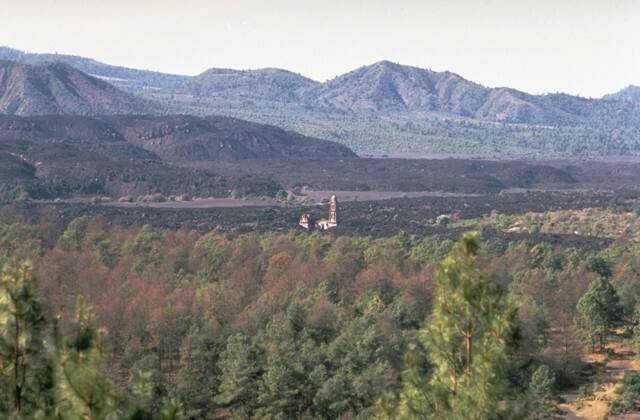 Lava flows in the foreground had already buried the town; the church tower seen in many other photos of the Parícutin eruption is hidden behind the small tree at the right. 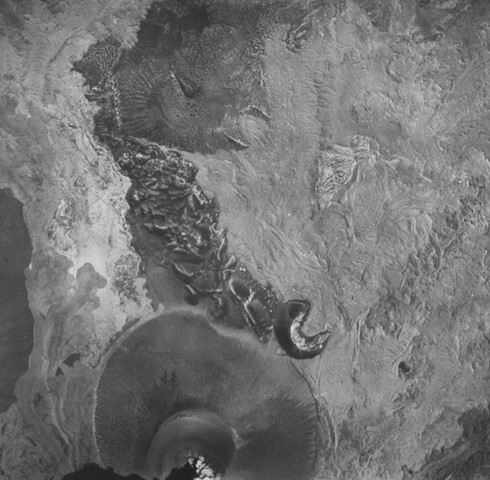 Photo by Carl Fries, 1945 (U.S. Geological Survey, published in Luhr and Simkin, 1993). An ash-rich eruption column in 1944 is photographed from the first observatory cabin 1.5 km north of Parícutin, with local eruption enthusiast Celedonio Gutierrez in the foreground. 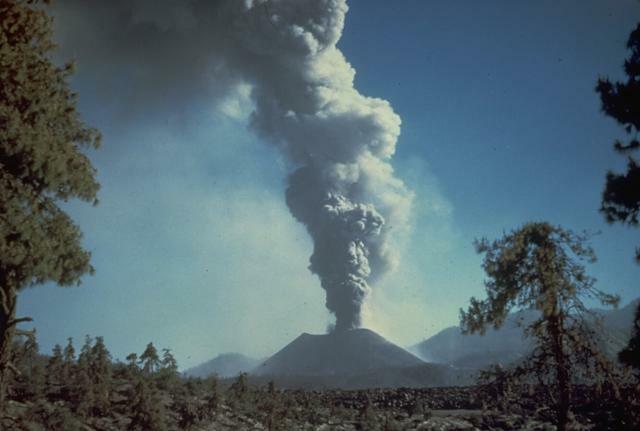 Gutierrez, born in the nearby town of San Juan Parangaricutiro, which at about this time had been overrun by lava flows, became actively involved in collaborations with U.S. scientists throughout the eruption. 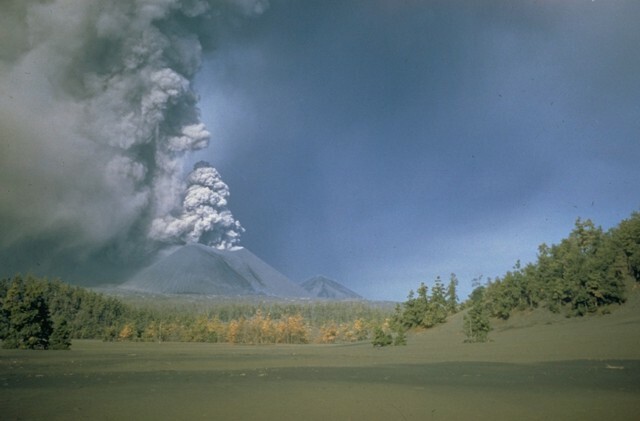 Photo by Ken Segerstrom, 1944 (U.S. Geological Survey, published in Luhr and Simkin, 1993). The first lava flow from Parícutin, the Quitzocho flow, moves northward over cornfields prepared for planting. A dark, ash-rich plume rises from the new cone, which by the time of this photo on February 25, the 5th day of the eruption, was already more than 150 m high. Steam rises from fumaroles on the advancing lava flow, and the flanks of the cone are obscured by dust and vapor. 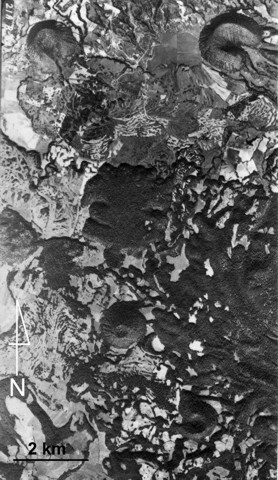 Photo by Instituto de Geología, 1943 (published in Luhr and Simkin, 1993). The steeple of the church of San Juan Parangaricutiro projects above surrounding lava fields in the center of the photo as seen from a viewpoint NE of the church. The still-unfinished church was overrun by lava in July 1944, a month after flows began advancing into the town. The unvegetated, steeper-sided viscous lava flows in the background were erupted later during 1944-46. Photo by Jim Luhr, 1982 (Smithsonian Institution). 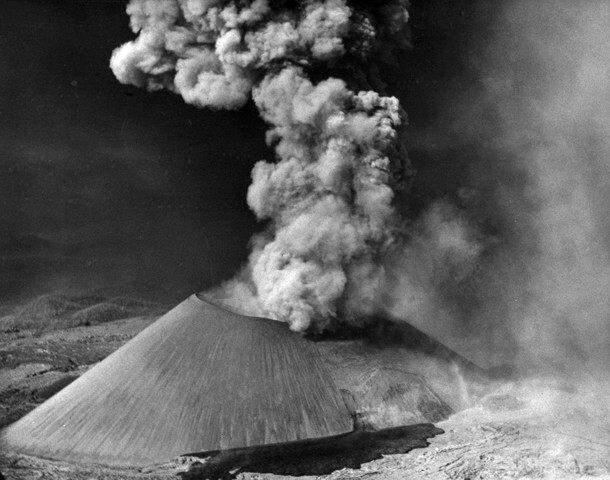 This spectacular nighttime time-exposure of México's Parícutin volcano in 1948 shows strombolian ejection of incandescent blocks and their trails as they roll down the slopes of the cone. Parícutin is renowned as the volcano that was born in a cornfield in 1943. It grew to a height of more than 150 m within the first week of its appearance, and remained active until 1952. Photo by Carl Fries, 1948 (U.S. Geological Survey). 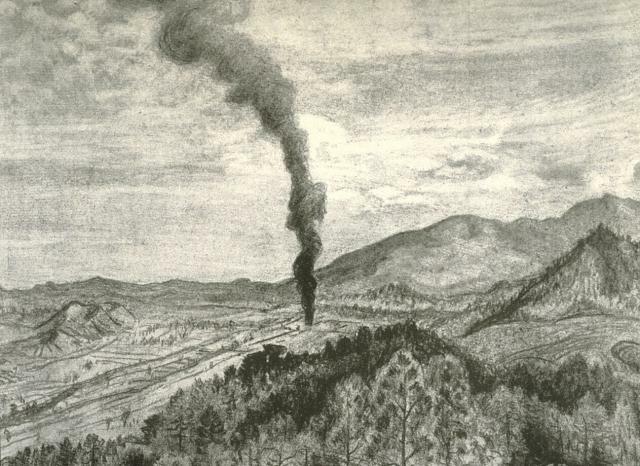 This sketch by Dr. Atl, the Mexican Renaissance man and noted artist, depicts the early moments of the birth of Parícutin volcano in a cornfield near the village from which the volcano was named. 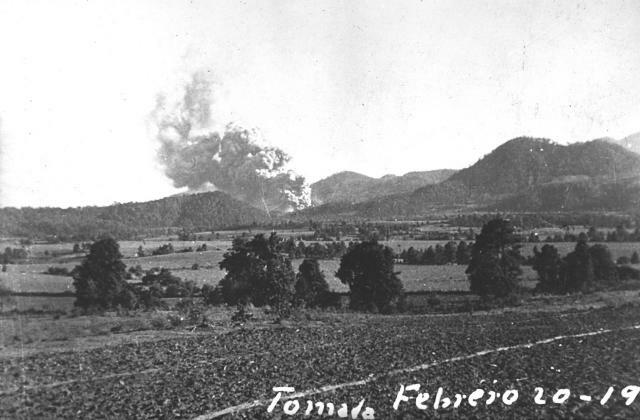 A Tarascan Indian farmer, Dionisio Pulido, observed the formation of the eruptive vent in his field about 4:30 pm on Feburary 20, 1943. He saw a fissure cut across the field as he was burning branches and noted that the ground around the vent raised up 2-2.5 m immediately prior to the onset of ash emission. Sketch by Dr. Atl, 1943 (published in Luhr and Simkin, 1993). 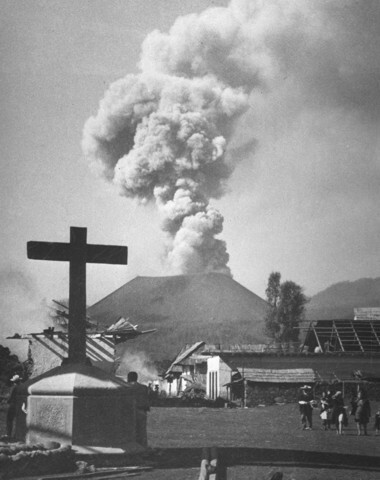 On July 7, 1944, a tongue of black lava (left) approaches the church of San Juan Parangaricutiro. Residents had already evacuated the town, which had first been invaded by lava flows on June 17. By the time the flow stopped in early August the church was entirely surrounded by lava. Photo by William Foshag, 1943 (Smithsonian Institution, published in Luhr and Simkin, 1993). 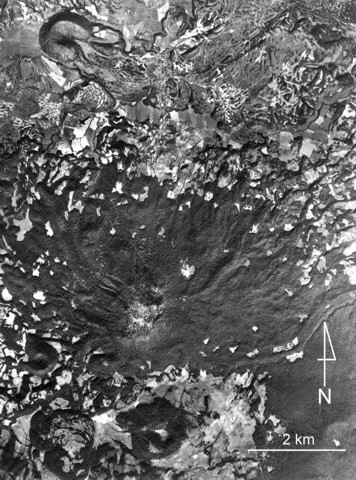 In mid-November 1944 lava broke out of the SSW base of the cone, below the south vent in the crater. Fresh black lava pours from the new vent in this view from the south. The Ahuán flow advanced over the earlier Taquí flows in the foreground. 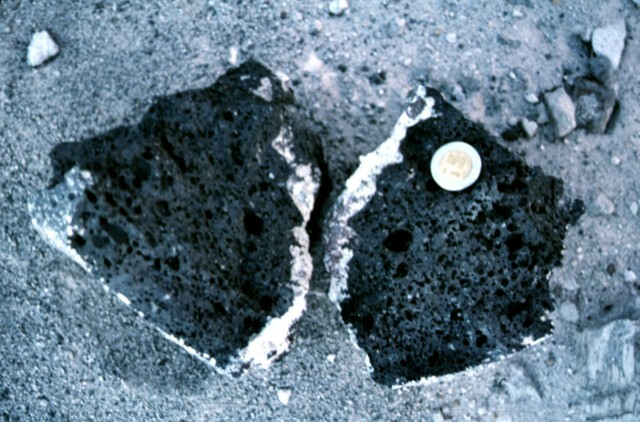 A small lava dike was exposed in the wall of the cone a short distance above the vent. Ahuán flows traveled around the east side of the cone to the north. Photo by Frank Zierer, 1944 (published in Foshag and González-Reyna, 1956). 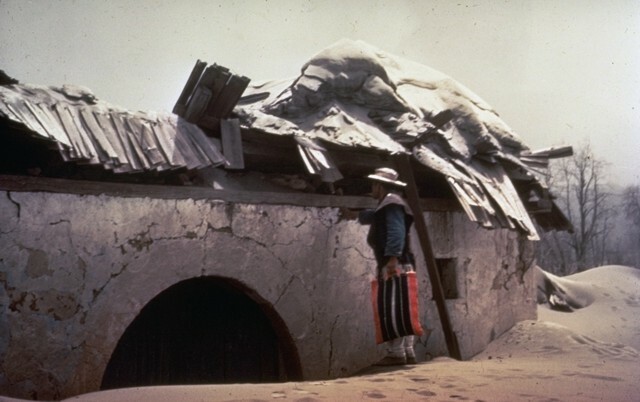 A villager inspects the roof of a house in the village of Parícutin destroyed by heavy ashfall in the first year of the eruption. The village that gave the volcano its name was located only 3 km NW of the new volcano. 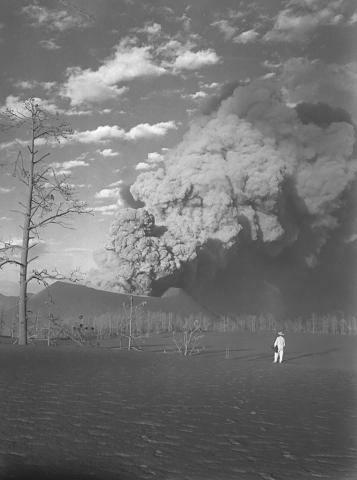 Ashfall was particularly intense during the eruption's second to fifth months, and the town's 733 residents were forced to evacuate four months after the eruption began. The Mexican government provided new lands in Caltzontzín, 27 km to the SE. Photo by Frederick Pough, 1943 (American Museum of Natural History). 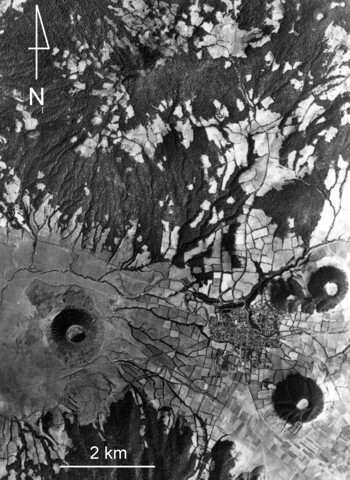 A vertical aerial photo of Parícutin taken on May 26, 1945 shows the cone at the bottom with the partially buried horseshoe-shaped vent Sapichu on its NE flank. Lava flows, forming the lighter-colored areas in the photo, surround the Quitzocho Ridge in the center of the photo and the older cinder cone of Cerro de Jarátiro at the top. Ultimately nearly the entire Quitzocho Ridge was buried by lava flows. 1:25,000 aerial photo by Comisión de Estudios del Territorio Nacional, 1945 (CETENAL). One of the first photographs taken of the Parícutin eruption shows an ash column rising from the new volcano at 6 pm on February 20, 1943, 1 1/2 hours after the start of the eruption. The photo was taken near Ticuiro, 5 km NNW of the volcano, with the fields of San Juan Parangaricutiro, later overrun by lava flows from Parícutin, in the foreground. 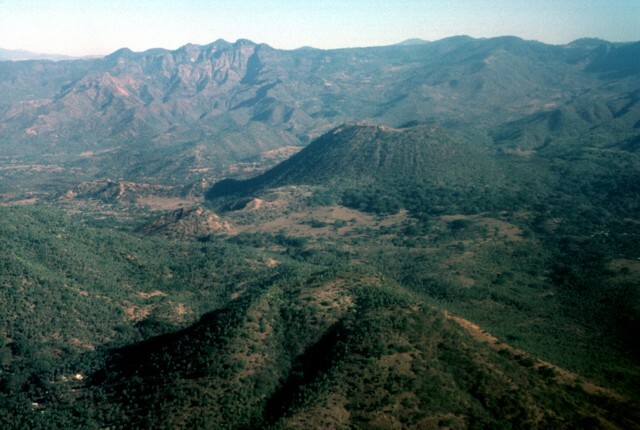 Cerro de Canicjuata is the forested older cone at the right. Photo by Luis Mora-Garcia, 1943 (published in Foshag and González-Reyna, 1956). A geologist observes a thick ash plume rising above the crater of Parícutin on March 22, 1944, from Mesa de Cocjarao, 1 km SW. The lowered south rim is due to scouring of the south crater vent by the eruption column. 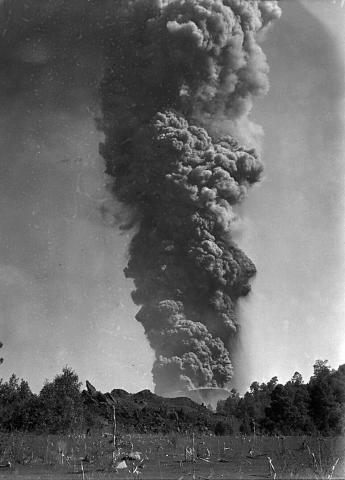 During March 1944 the eruptive activity ranged from a weak explosive column accompanied by deep rumbling to large, but almost soundless cauliflower columns such as the one shown here. Photo by William Foshag, 1944 (Smithsonian Institution, published in Foshag and Gonzáles-Reyna, 1956). Villagers observe an ash column rising above Parícutin in 1944 beyond the streets of San Juan Parangaricutiro, soon to be overrun by lava flows from the volcano. In June and July 1944 lava advanced slowly through the town, which was incrementally evacuated under the relentless onslaught of the lava. Many residents, with a deep attachment to the land, stayed until the lava overran the last segments of their property. Photo by William Foshag, 1944 (Smithsonian Institution, published in Luhr and Simkin, 1993). 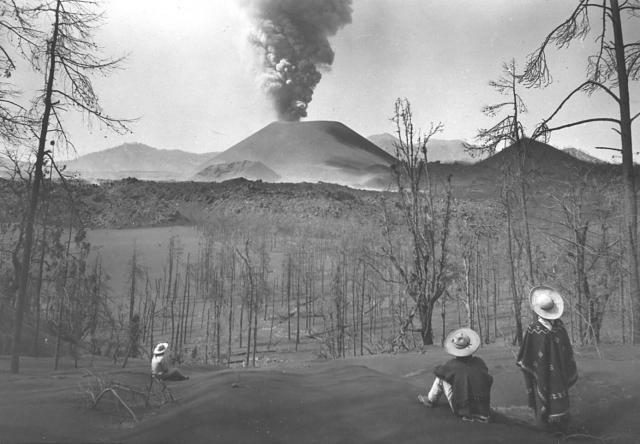 Tarascan Indians observe Parícutin volcano from Cerro de Equijuata, 2.5 km NNE, in March 1944, a little more than a year after the eruption began. The then-extinct parasitic cone Sapichu appears at the NE (left-hand) base of the cinder cone. The rugged lava flows of June 1943 occupy the middle of the photo. Heavy ashfall has defoliated trees, and a thick blanket of ash mantles the landscape. Photo by Arno Brehme, 1944 (U.S. National Archives, published in Foshag and Gonzáles-Reyna, 1956). On March 24, 1943, a little more than a month after the start of the eruption, an ash-rich eruption column towers 6 km above Parícutin. 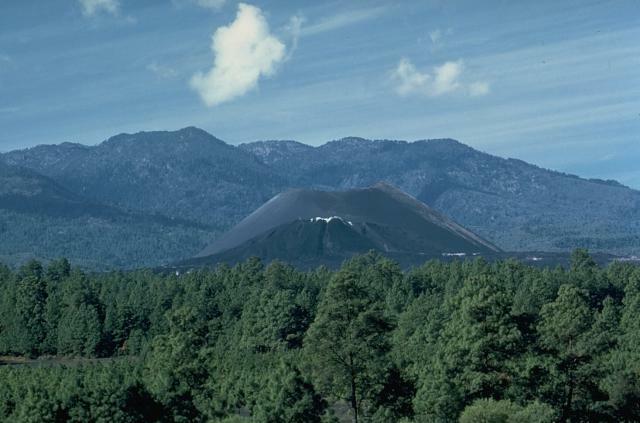 The photo was taken from Tititzu, 3 km north, and shows the advancing front of the Mesa del Corral lava flow in the middle ground, with the rim of the cinder cone behind it. Photo by William Foshag, 1943 (Smithsonian Institution, published in Foshag and Gonzáles-Reyna, 1956). An ash-rich eruption column roils from the summit crater of Parícutin volcano sometime during 1946-48. A thick blanket of ash mantles the foreground. An estimated 4500 cattle and 550 horses died during the heavy ashfall in the early months of the eruption, devastating the local people who depended on the animals for food, plowing, and transportation. Ashfall was deeper than 15 cm over a 300 sq km area around the volcano, and continued with varying intensity throughout the 9-year-long eruption. Photo by Ray Wilcox (U.S. Geological Survey). Jorullo volcano, 81 km SE of Parícutin, was born in 1759 during the first historical eruption of the Michoacán-Guanajuato volcanic field. In this view from the NW, the final tongue of still-unvegetated lava that flowed north from the crater rim is visible on the center horizon. One of Jorullo's four parasitic cones, Volcán del Norte, appears on the left horizon. 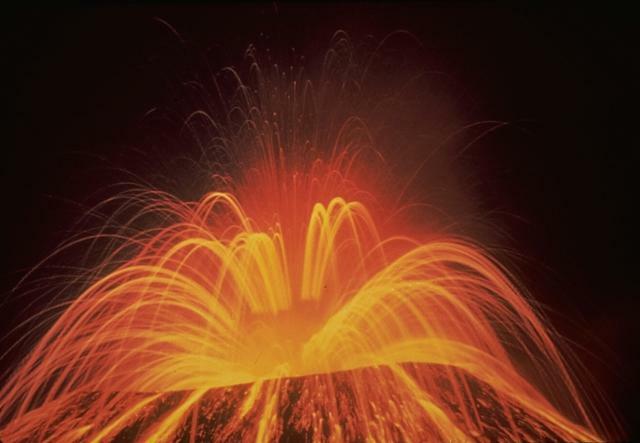 It fed a lava flow toward the west during the middle stages of the 1759-74 eruption. Photo by Jim Luhr, 1996 (Smithsonian Institution). 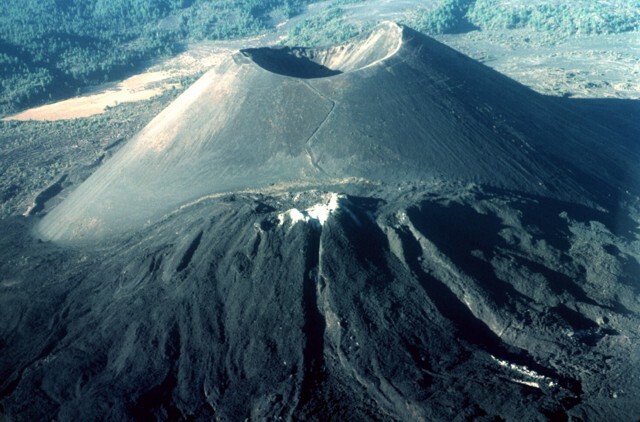 The principal vent of Jorullo volcano, seen here from the SSE, formed a cinder cone that grew to 250 m in height during the first month and a half of the eruption. Lava flows were erupted at some unknown later time from four flank vents located along a NE-SW fissure cutting through the main cone. The latest lava flows of the 1759-74 Jorullo eruption appear at the left and foreground of this view from the north with the sparsely vegetated cone of Jorullo at the upper right. Unlike earlier lava flows that were covered with ashfall from explosive eruptions, this latest flow is ash free and remains relatively unvegetated. Lava flows from Jorullo were erupted from NE-SW-trending flank vents and covered an area of 9 sq km. 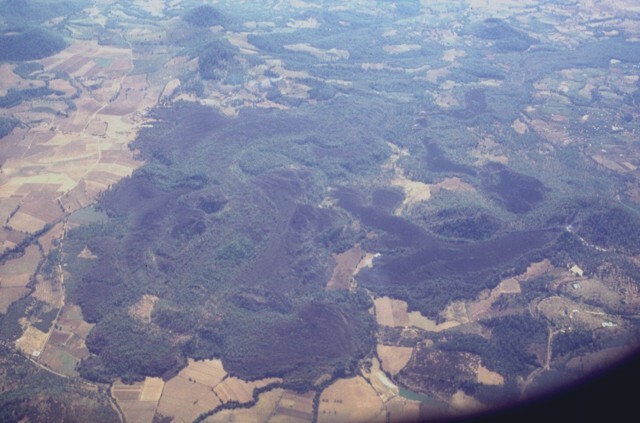 Youthful lava flows in the western part of the Michoacán-Guanajuato volcanic field are seen in an aerial view from the north. 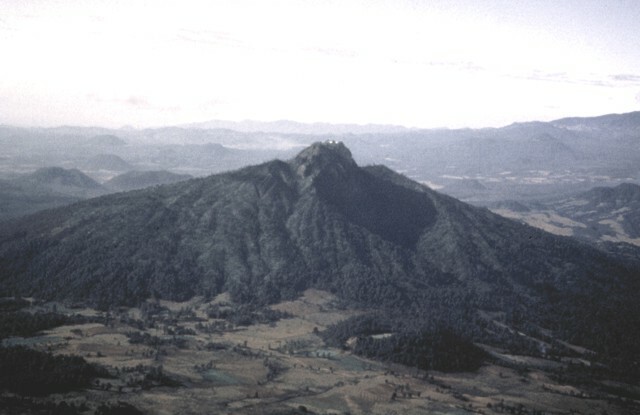 Cerro el Astillero, a cinder cone near the middle right-hand margin of the photo, was the source of the unvegetated lava flow that extends to the east and then south. Cerro el Pedegral, a cone near the lower left, fed lava flows to the west and south toward the upper part of the photo. This lava field is located near the town of Tancítaro and is among the many Holocene flows in the Michoacán-Guanajuato field. Since the end of the 1759-1774 eruption the crater of Jorullo volcano has been collapsing inward along steep, arcuate step faults, increasing its diameter to 400 x 500 m; its current depth is 150 m. Sparsely vegetated lava flows can be seen at the top below the north flank of the cone. Photo by Jim Luhr, 1997 (Smithsonian Institution). 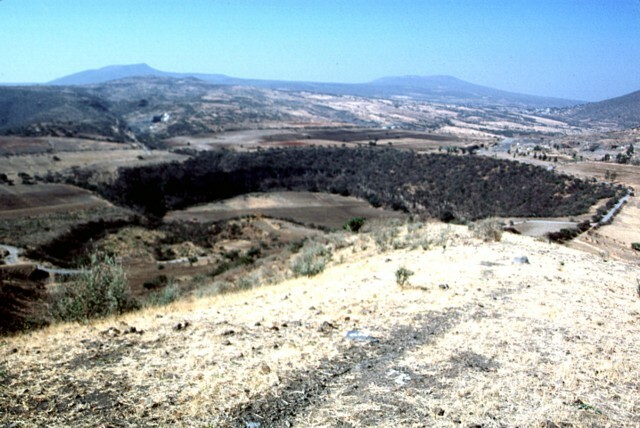 Jorullo cinder cone, its crater seen here from the ENE, was the first volcano of the Michoacán-Guanajuato field to be born in historical time. 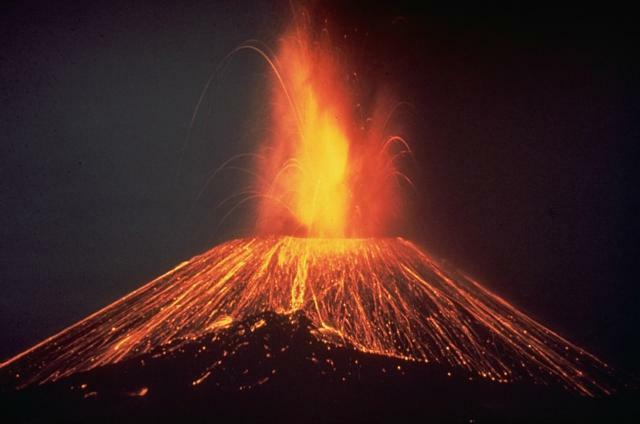 The eruption began with phreatic and phreatomagmatic activity on September 29, 1759. 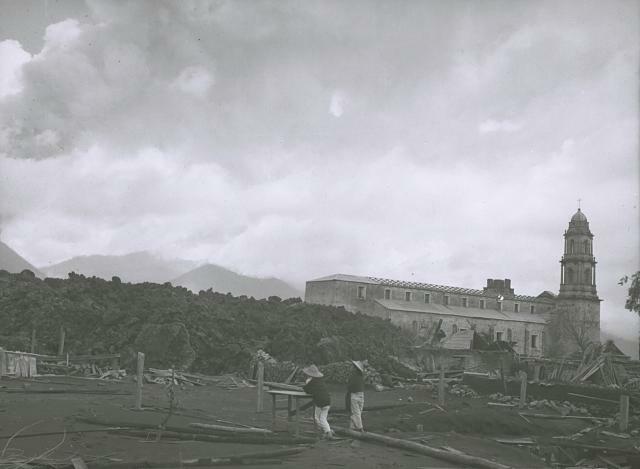 Wet ashfalls and mudflows in the first days caused much damage to neighboring haciendas. By November 13 the cone had reached 250 m height. The long-term eruption continued until 1774. The sparsely vegetated lava flow at the right was the latest product of the eruption. Parícutin, the volcano born in a cornfield in 1943, is the best-known feature of the Michoacán-Guanajuato volcanic field. The huge volcanic field contains over 1400 vents covering a wide area of Michoacán and Guanajuato states. Cinder cones are the predominant volcanic form, but small shield volcanoes, lava domes, maars, tuff rings, and coneless lava flows are also present. Parícutin is seen here from the NE with the flank vent of Nueva Juatita, the main source of lava during the last five years of the eruption, in the foreground. At the end of the 9-year-long eruption of Parícutin, the new cinder cone rose 424 m above the surface of the original cornfield. The 900-m-wide oval-shaped cone is elongated in a NW-SE direction and is truncated by a circular, 280-m-wide crater. The western peak (right) is the highest point on the crater rim. The NE-flank peak of Nuevo Juatita in the foreground, its top covered by white fumarolic sublimate minerals, was the main source of lava flows during the last five years of the eruption. 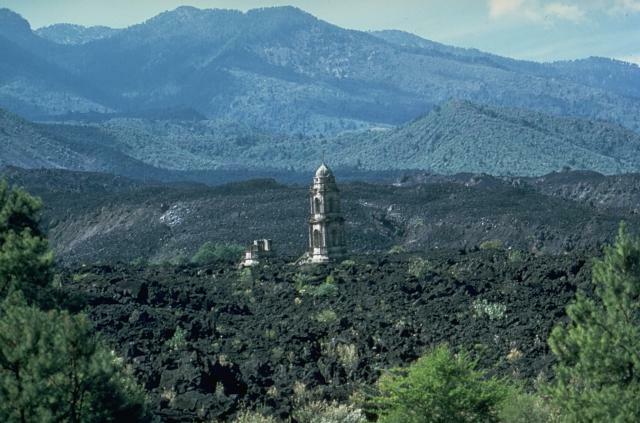 The small light-colored spire in the center of the photo is the renowned steeple of the church of San Juan Parangaricutiro, which was surrounded by lava flows from Parícutin volcano in 1944. This view from the NE shows the flat-lying 1944 Parícutin lava flows in the center of the photo. The steep-sided, viscous lava flows in the background were erupted later, during 1944-46. The renowned Parícutin cinder cone, which grew from a Mexican cornfield beginning in 1943, is one of the roughly 1000 cinder cones dotting the massive Michoacán-Guanajuato volcanic field in central Mexico. White fumarolic sublimate minerals blanket the top of Nuevo Juatita in the foreground, a NE-flank vent that was the main source of lava flows during the last five years of the 1943-1952 eruption. 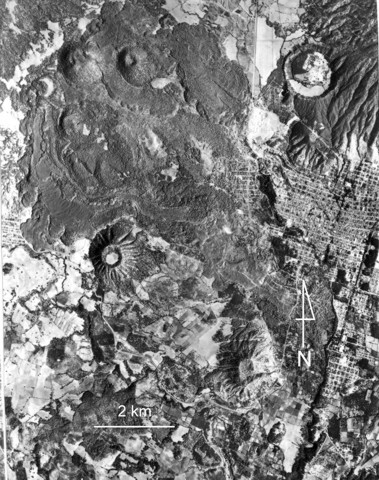 Jorullo volcano (right-center) is seen in an aerial view from the SSW with Cerro la Pilita cone in the foreground. The SW-flank satellitic vents of Jorullo are visible as the small, less-vegetated cones at its left base. Lava flows from these flank vents were erupted in the middle part of the 1759-1774 eruption and moved to the NNW (left). Cerro la Pilita is an older cone that emitted pre-historical lava flows along a narrow channel to the SW.
A strombolian eruption lights the nighttime sky at Parícutin. The time-exposure photo tracks the trajectory of incandescent bombs, which also dot the flanks of the cone. For many years Parícutin provided a colorful display that was the object of both camera lenses and paint brushes. 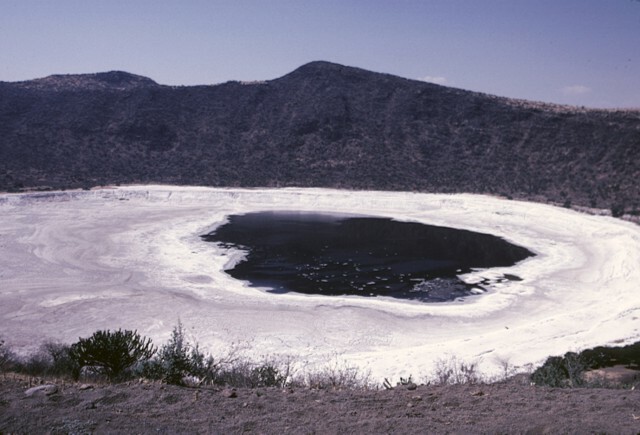 The Valle de Santiago in the NE part of the Michoacán-Guanajuato volcanic field NW of Lake Yuriria contains a group of youthful maars formed by phreatomagmatic eruptions. 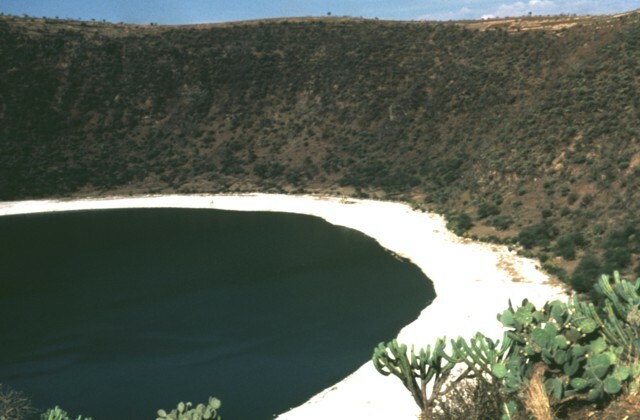 The maars, four of which are lake-filled, range from 0.8 to 1.8 km in diameter and are 80 to 180 m deep. They were formed very recently and are of probable Holocene age. This photo shows the Hoya Rincón de Parangueo maar at the northern end of the maar field. Paracho volcano is one of the many small stratovolcanoes of the Michoacán-Guanajuato volcanic field. It is seen here from the west with its summit crater filled by a flat-topped lava dome that is the site of a radio antenna station. The dome fills the head of a large erosional valley that extends from the summit to the volcano's flank. Edifice collapse has affected the eastern side of the volcano, producing a major debris-avalanche deposit covering an area of about 175 sq km. Photo by Hugo Delgado, 1991 (Universidad Nacional Autónoma de México). Lava flows from Parícutin (upper center) cover much of the northern third of the photo. The small white dot above and to the right of Parícutin is the NE-flank vent mound of Nuevo Juatita. The latest lava flows from Parícutin during 1952 originated from this vent and form the darker-colored flows that extend to the ESE. Cerro Tzirapan is the prominent older cinder cone at the right-center, and other older cones appear at the upper left. Aerial photo by Comisión de Estudios del Territorio Nacional (CETENAL), 1970. Ashfall from Hoyo el Huanillo cinder cone (lower left) was radiocarbon dated at about 9300 years ago. A small ash-covered lava flow extends a short distance to the NW of the cone, which is located 35 km NE of Parícutin. 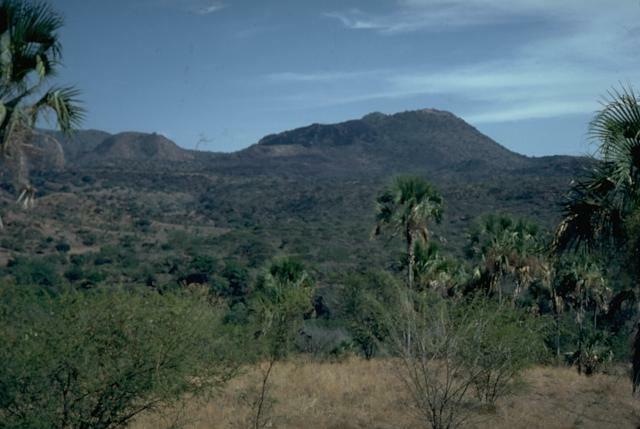 The prominent cinder cone of Cerro Cucundicata is at the lower right, and the twin cones of Cerro Borrego and Cerro Tarucun are located nearby, NE of the town of Cherán. The eroded stratovolcano Cerro Pacaracua forms much of the upper part of the photo. Aerial photo by Comisión de Estudios del Territorio Nacional (CETENAL). Jorullo volcano, which erupted during 1759-1774, and associated lava flows are visible at the bottom of the photo. Four NE-SW-trending vents flank the main cone of Jorullo. The 1759-1774 lava flows appear in varying shades of gray, with the initial (and largest) flows being lighter in color (due to partial ash cover) and the most recent ash-free lava being darker and extending to the NW and NE. Jorullo lies about 80 km SE of Parícutin. Cerro el Jabalí (upper left) and the adjacent Cerro el Sapien (immediately to the east) produced the young unvegetated lava flow extending across the top of the photo. Ashfall from Cerro el Jabalí cinder cone, located about 15 km SE of Parícutin, was dated at about 3830 years ago. An even fresher lava flow with prominent flow levees was erupted from the small cone immediately SW of Cerro el Jabalí and may be even younger. The city of Uruapan is at the right side of the photo, south of the circular Costo (Cerro Cotji) maar. 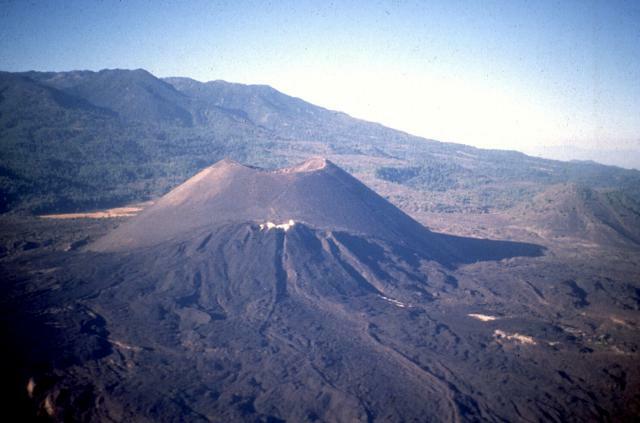 Volcán la Mina, the cinder cone near the center-left margin of the photo, was radiocarbon dated at about 17,170 years ago. It is located about 90 km NE of Parícutin. The breached cone fed a large lava flow to the NE. 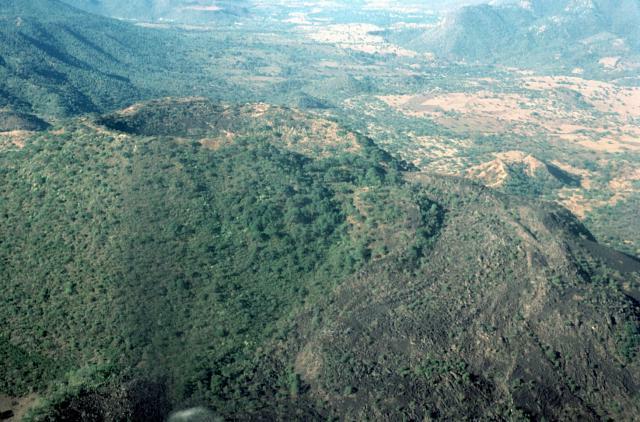 Another breached cone, Volcan el Melón (lower left), was the source of a lava flow that traveled east to the present-day outskirts of the village of Capalu and appears to be younger than Volcán la Mina. 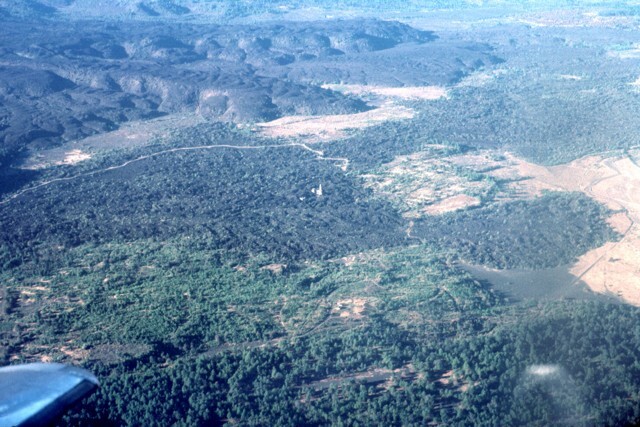 Cerro el Pueblito (upper left), radiocarbon dated at about 29,000 years ago, was the source of the lava flow that extends eastward across the photo. The older cone of Cerro las Cabras (upper right) partly deflected the flow. The irregular dark-colored area south of the lava flow is La Vibora, a "coneless lava flow." Cerro Arena is the symmetrical cinder cone in the center of the photo. The large forested area on the right side of the photo is Cerro Tecolote, an eroded stratovolcano with flank cinder cones. The large forested area above the center of the photo is Cerro Tecolote, an eroded stratovolcano. 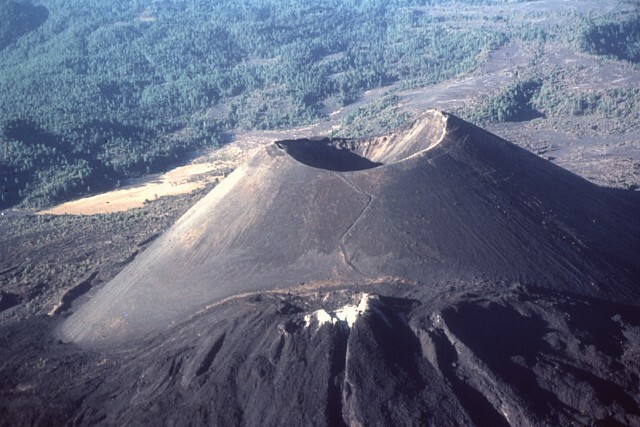 Cerro la Cabras (upper left) is a prominent breached cinder cone located roughly 50 km NE of Parícutin that fed a lava flow that extends across the upper part of the photo. Mexican highway 15 travels across the flow, which is of Pleistocene age. Cerro Pajarito cinder cone lies just south of Cerro Tecolote, and another cone is on the SW flank of the volcano. The Hoya Rincón de Parangüeo maar is viewed here from its southern rim, which rises directly above the town of the same name on the lower southern flank of the maar. A brackish lake of seasonally variable size partially fills the floor of the 2-km-wide maar. The 2050-m high point on the northern rim rises 450 m above the crater floor. Rincón de Parangueo is part of the Valle de Santiago maar field on the NE side of the Michoacán-Guanajuato volcanic field and lies about 7 km NW of the town of Valle de Santiago. Photo by Jim Luhr, 2002 (Smithsonian Institution). Geologist Todd Housh observes dune-bedded pyroclastic-surge deposits in the wall of an abandoned quarry on the north flank of Hoya Estrada maar, directly west of the town of Valle de Santiago. 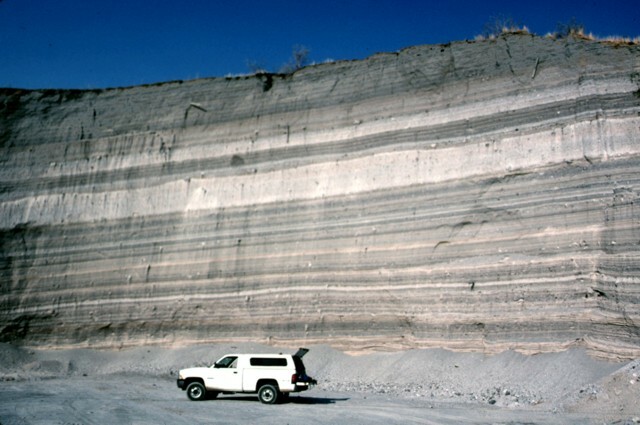 Laminar and wave-bedded pyroclastic surge layers are visible at the bottom of the outcrop, and airfall layers occur at the top. Travel direction of the pyroclastic surges was from right to left. The steep-sided walls of a quarry on the SW flank of Hoya Estrada maar in the Valle de Santiago volcanic field show a spectacular sequence of deposits from the maar-forming eruptions in this view looking ENE in the direction of the vent. Most of the outcrop consists of gray-colored dominantly planar pyroclastic-surge beds. The three prominent light-colored layers are airfall deposits. The largest airfall layer just above the middle of the outcrop is about 2 m thick. Basaltic scoriae blocks from the Hoya Estrada maar have light-colored silicic rims. This results from large scale mixing of basaltic magmas with silicic end members leaving remnants of the light-colored silicic magma on the outside of the blocks after deposition. Coin provides scale. The dry-floored Hoya Solis maar is seen from the SW rim of Hoya Blanca maar, immediately SW of the city of Valle de Santiago. The rim of Hoya de Cintora maar lies beyond Hoya Solis below the far left horizon, and a light-colored quarry is faintly visible on the lower NW flanks of Cintora maar. The 600-m-wide Hoya Solis maar is one of the smallest of Valle de Santiago volcanic field, located in the NE part of the Michoacán-Guanajuato volcanic field. The following 623 samples associated with this volcano can be found in the Smithsonian's NMNH Department of Mineral Sciences collections, and may be availble for research (contact the Rock and Ore Collections Manager). Catalog number links will open a window with more information. 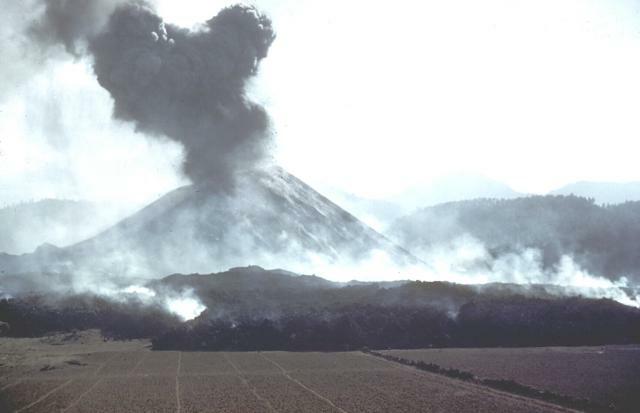 Large Eruptions of Michoacán-Guanajuato Information about large Quaternary eruptions (VEI >= 4) is cataloged in the Large Magnitude Explosive Volcanic Eruptions (LaMEVE) database of the Volcano Global Risk Identification and Analysis Project (VOGRIPA).